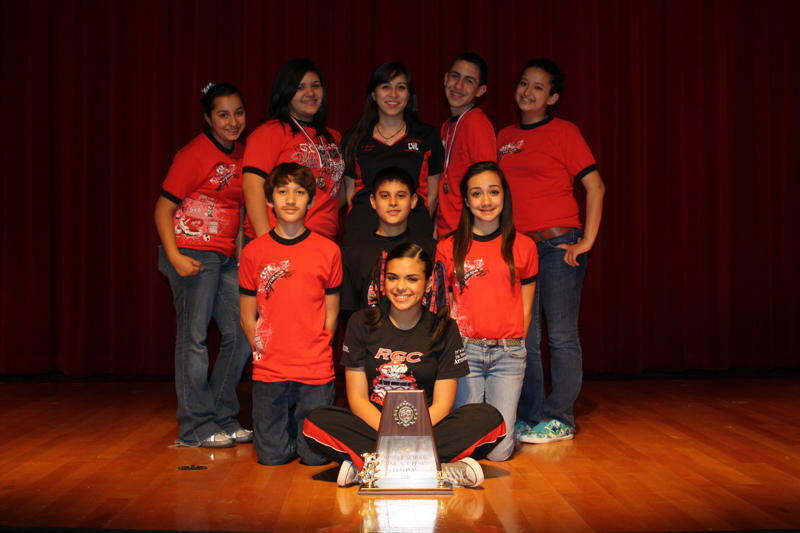 VETERANS MIDDLE SCHOOL - Congratulations to the One Act Play Cast from Veterans Middle School for earning 1st Place at the One Act Play Festival which was held at the Paco Zarate Fine Arts Auditorium on March 5, 2011. The VMS cast competed against schools from Rio Grande City, Roma, and Zapata and performed the play entitled, “Good-bye to the Clown” by Ernest Kinoy. In addition, three actors from the VMS cast also earned further recognition by winning individual medals and trophies. These cast members were Alexia Andrade (All Star Cast), Devin Ramirez (Best Actor), and Anissa Galvan (Honorable Mention). Congratulations to the VMS cast, crew members, and directors for their talent and dedication. A special thanks to the VMS parents, staff, and administration for their continued support. Pictured above are cast and crew members top to bottom (l-r) Haulen Garcia (Crew), Anissa Galvan (Dr. Benson), Savannah Lopez-Lozano (Director), Devin Ramirez (Clown), Gabriela Garcia (Miss Ervin) middle row Vicente Gomez (Uncle George), Lino Carrion (Crew), Meagan Munoz (Mother) bottom Alexia Andrade (Peggy).